The date is getting close! The third annual WillaMutt Strut 5K Fun Walk & Run at Riverfront Park June 14th. 8 a.m. check-in. 9 a.m. start. 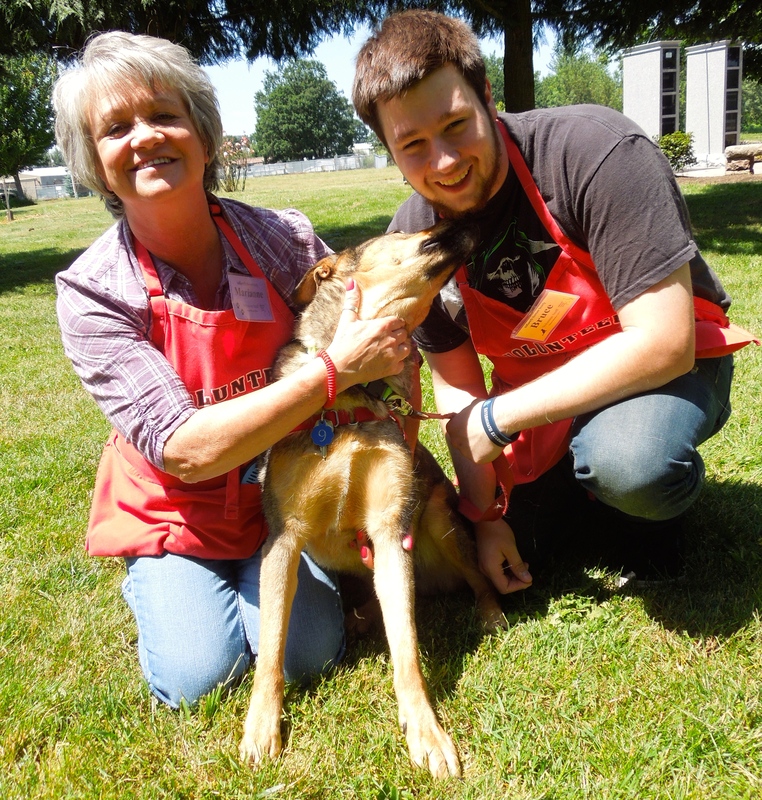 Let’s make this year’s even better than last to help the dogs and cats at WHS! Click here to register! 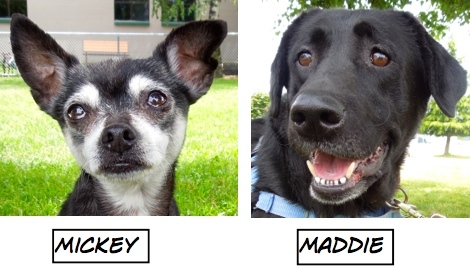 There were ten dog adoptions during the last week including four very happy Blog Dogs. 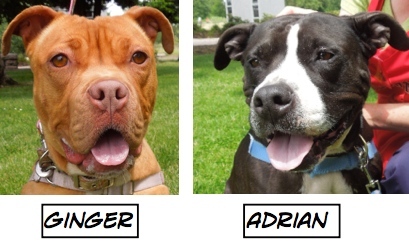 There is an especially sweet story about Adrian’s adoption. 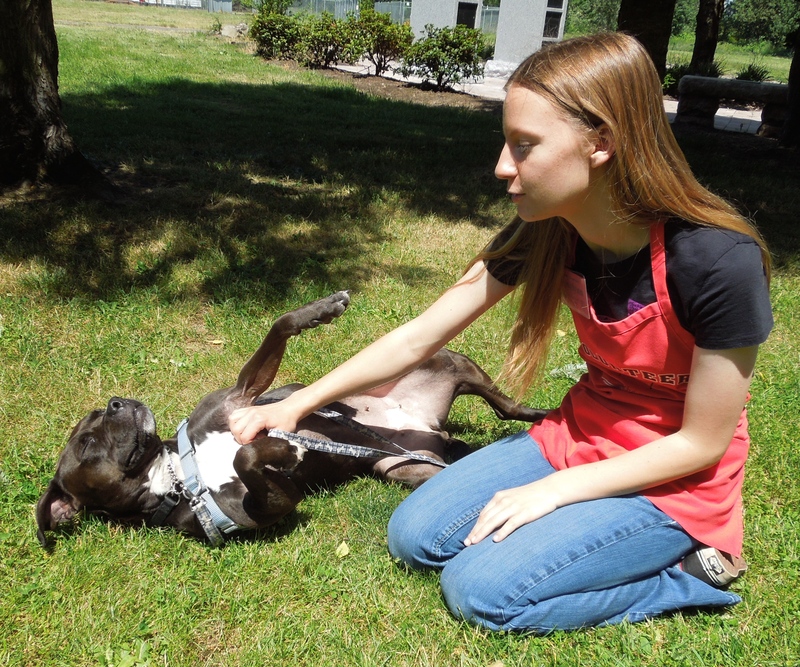 A few months ago, BJ, our volunteer manager, asked me to be a mentor for a high-school senior girl who was working on a project about the misinformation concerning Pit Bull Terriers. I met with Jasmine several times and we talked about Pit Bulls, played with Pit Bulls, and took pictures of her with Pit Bull shelter dogs. Here, in her own words, is her story. I was very happy that I was at WHS when Jasmine, her father, and little sister came to take Adrian home. 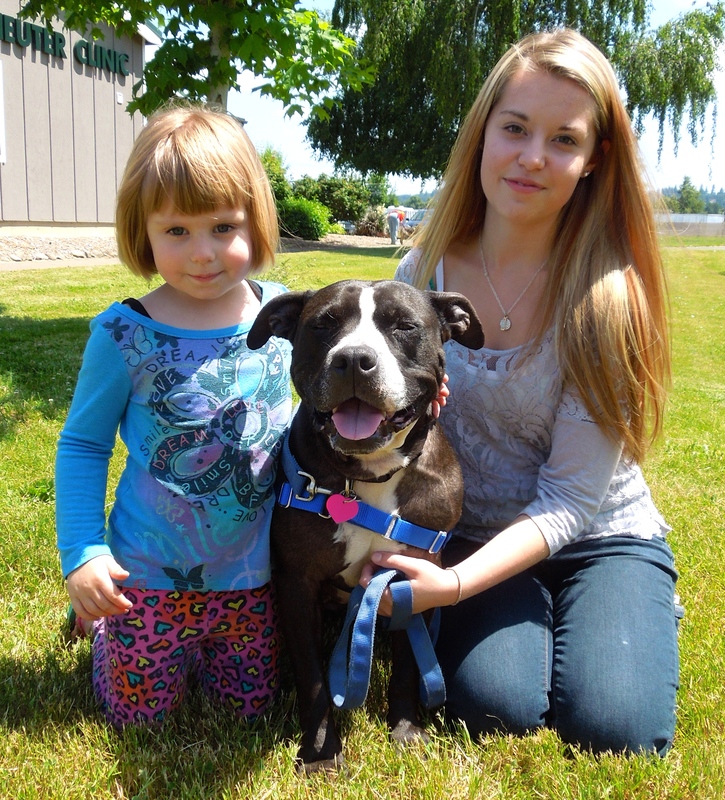 Adrian had been waiting for her forever home since March 30. Here staff member Janie is getting Adrian ready to go. And here she is about to head off to a brand new happy life! I’ll have an update on Adrianna at the end of this post. I had to miss play group again this week and probably will miss a few more. (My husband broke his leg, had surgery, is recovering.) 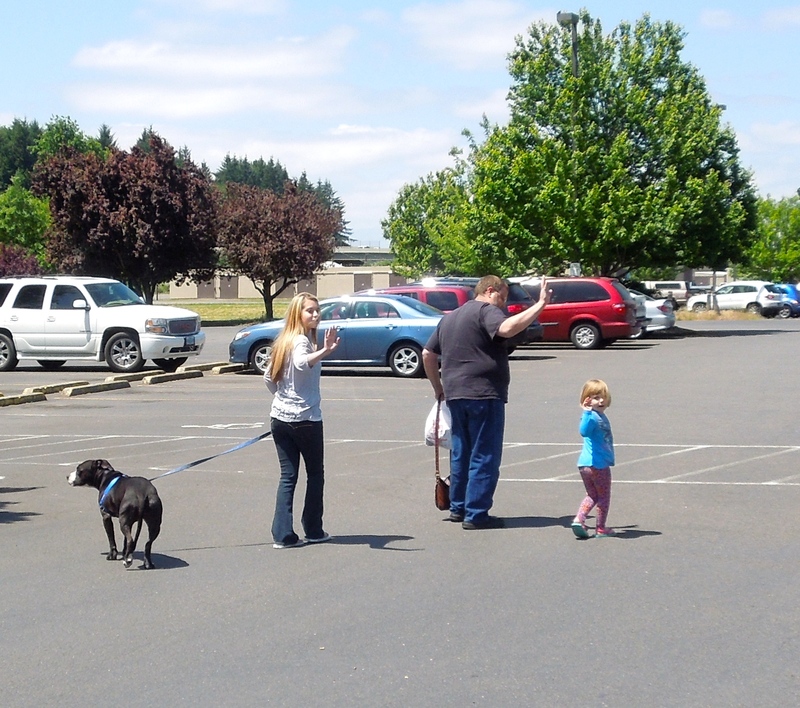 But volunteer Jeff sent me these pictures of puppy Sam’s first play group. You’ll remember that last week Sam hadn’t had all of his vaccinations, so had to be wheeled on a cart to a visitation room for exercise, since he was too big to be carried. It seems Sam got quite fond of his wheels. 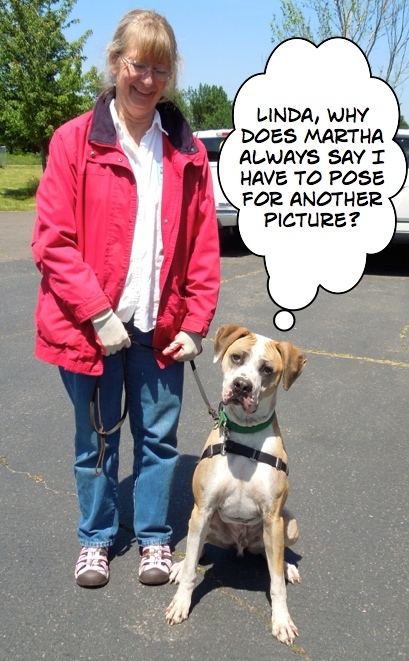 Sam had a wonderful time in play group both Sunday and Tuesday, I was told, and did great with the other dogs. 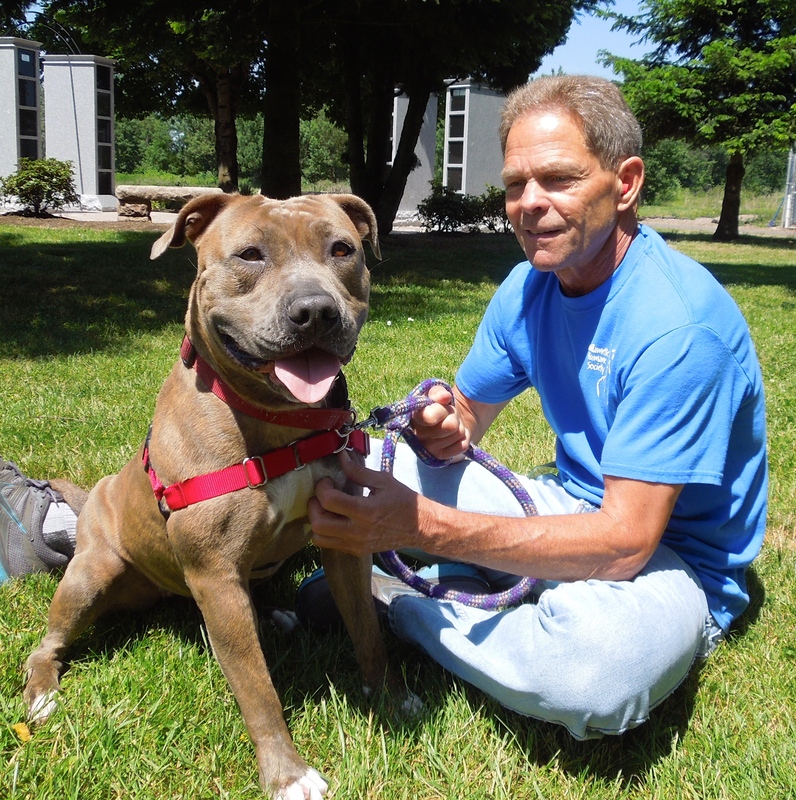 I’m Bruce’s FAVORITE shelter dog here! Just ask him! Really! Ask him! Yep, it’s true. When I saw Bruce out with Pancho again this week, I could tell. As you can see, they share the same sense of humor. 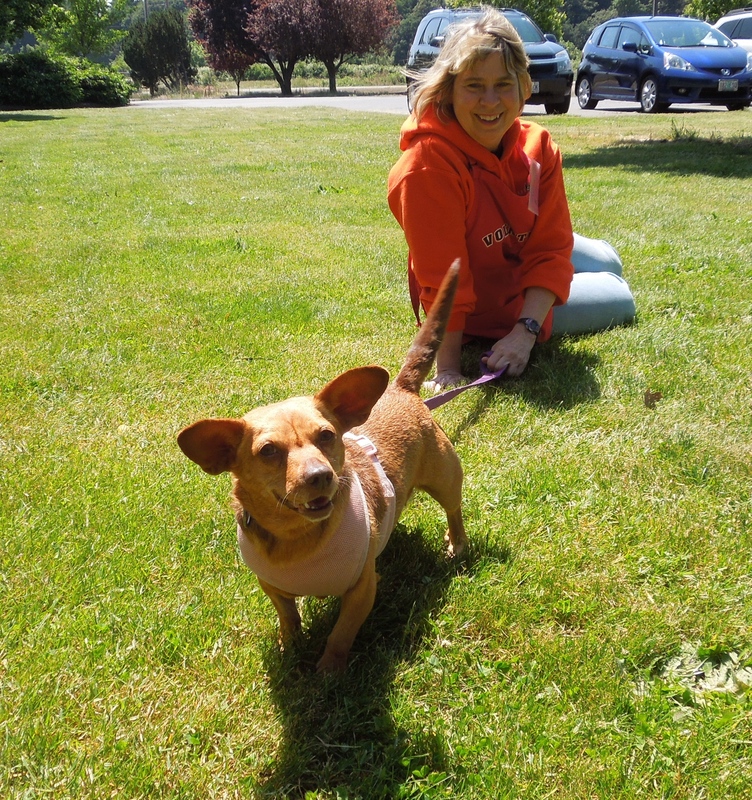 I first wrote about Pancho in November of 2012 when he arrived at WHS. He came to us as an outdoor dog. 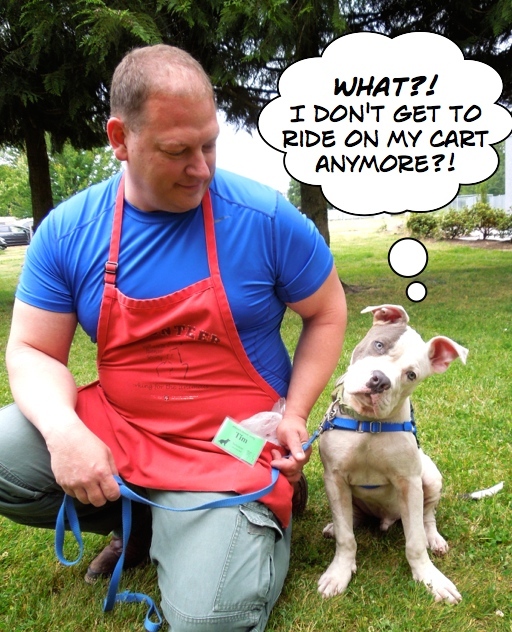 He has spent the last several months at another rescue and has now come back to us hoping for just the right home. He does fine with other dogs. 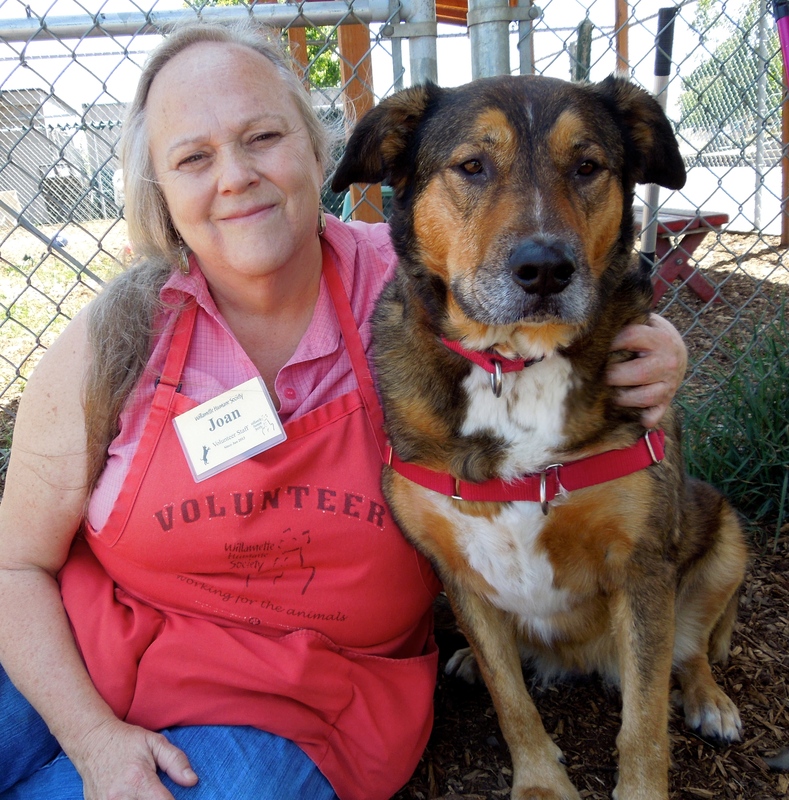 He loves being with people and is affectionate and eager to learn, but doesn’t have to be with someone all the time. Bruce says he’s a quick study and he ought to know, since he taught Pancho to shake in one session (see below). 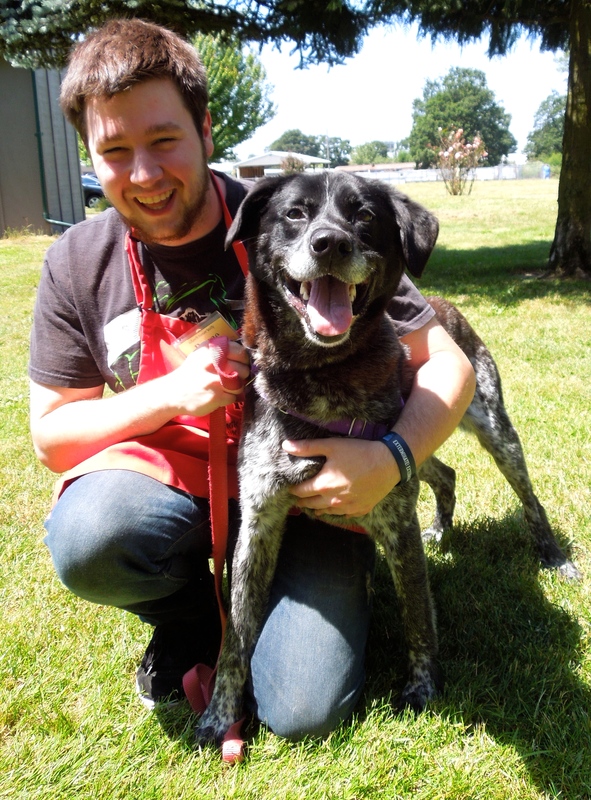 Pancho is an eight-year-old Pointer/Collie mix. We’re hoping he’ll find his forever home very soon! 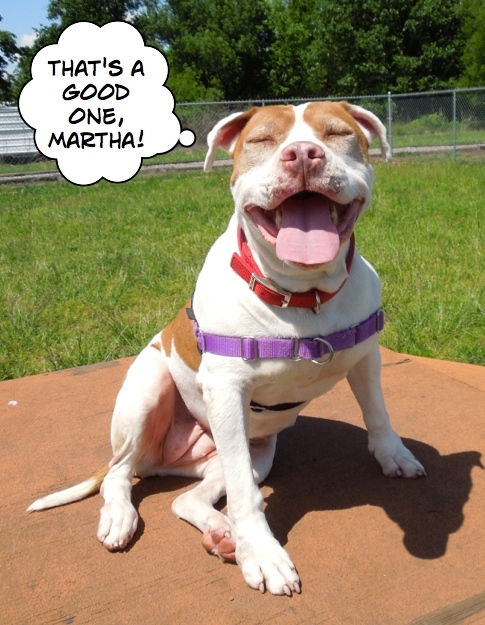 I’m new, but am quite popular here at the shelter! I’ll make a great new family member! 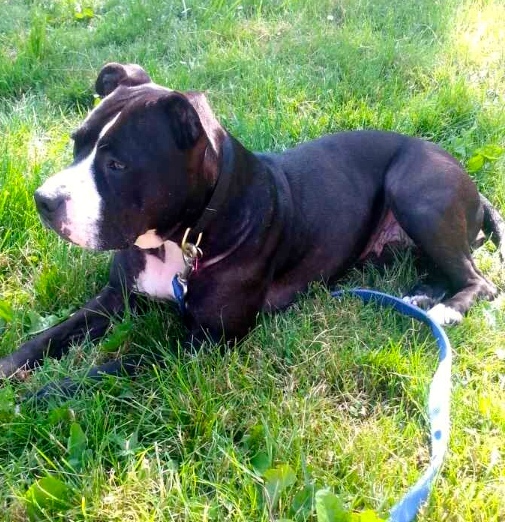 Looking for an active, eager, smart young dog to go jogging, running, or hiking with? 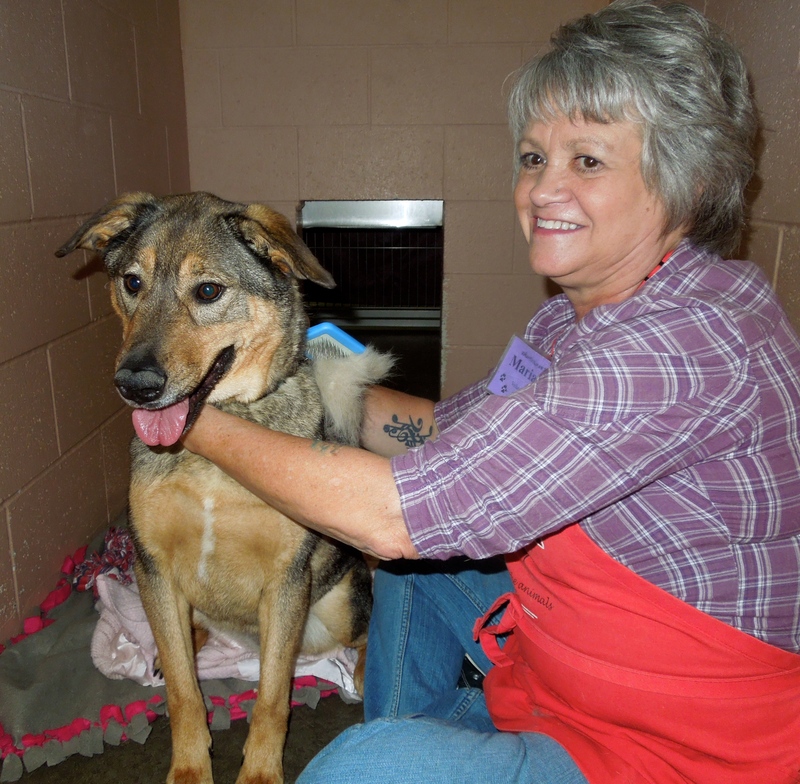 Sophie, a two-year-old Shepherd mix might be your new best friend! She is a California S.T.A.R.T. dog, so we don’t know about her past, but she already knows some commands and would be a great student in one of our WHS training classes. Here she is with Karla on Sunday. Later in the afternoon, Bruce and Marianne spent some quality time with this young girl. And after that, I found Marianne giving Sophie a good brushing in her kennel, which, as you can tell, Sophie thoroughly enjoyed. I’ve been here quite awhile. Do you need a friend? 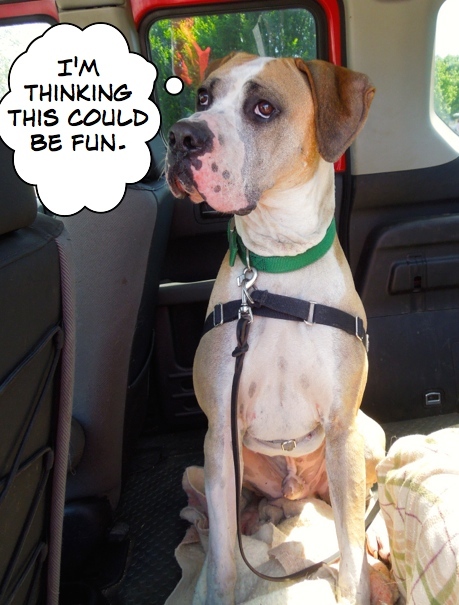 Rocco is still waiting for a new family to find him. He’s such a good boy. 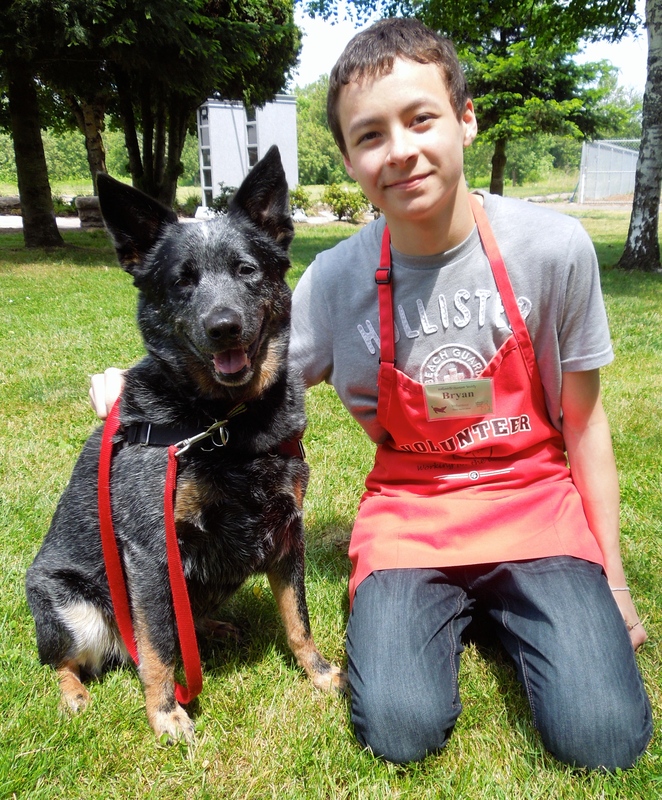 He has a great history with kids, walks well on leash, takes treats gently, and loves to be with people. 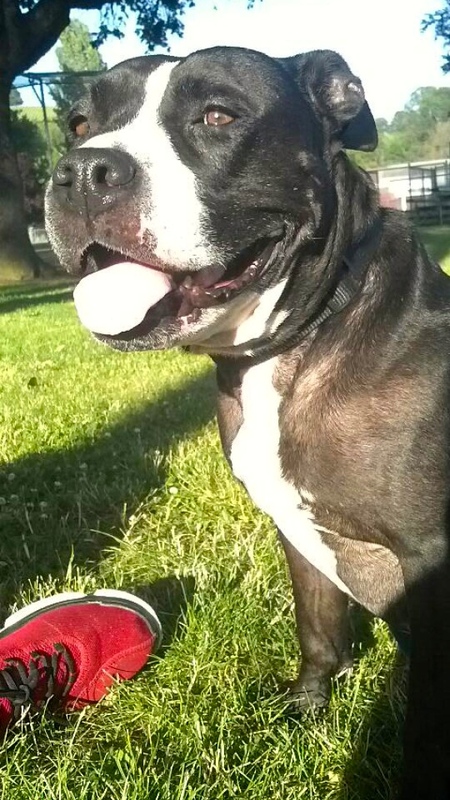 He’s a nine-year-old Bull Dog/Pit Bull Terrier mix. But don’t let his age influence you. This boy has lots of energy to play, but the maturity to settle in and relax when you want quiet time. 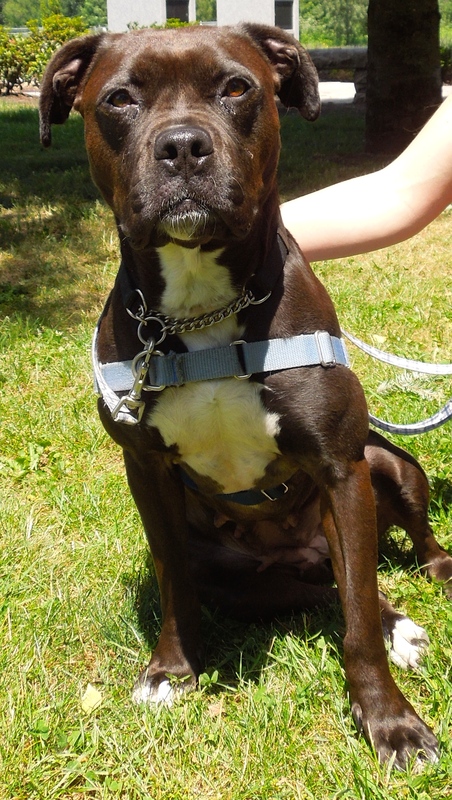 I can’t understand why Rocco hasn’t been snatched up by some lucky family. Here he is on Sunday with Andy. I keep hoping this will be the last week I need to feature this sweet guy. My name is Penny. I am looking for a family. How about your family? 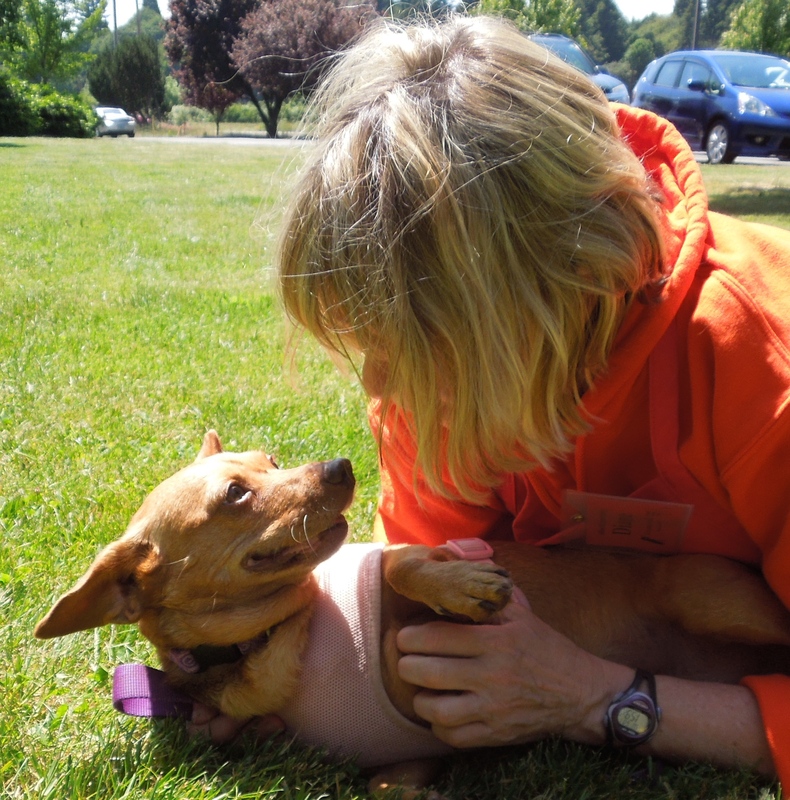 When Penny, a seven-year-old Chihuahua/Dachshund mix, arrived at WHS, she was a frightened, nervous little dog. She came from California and all of the sounds and people of a new place were overwhelming to her. What a difference a couple of weeks make! 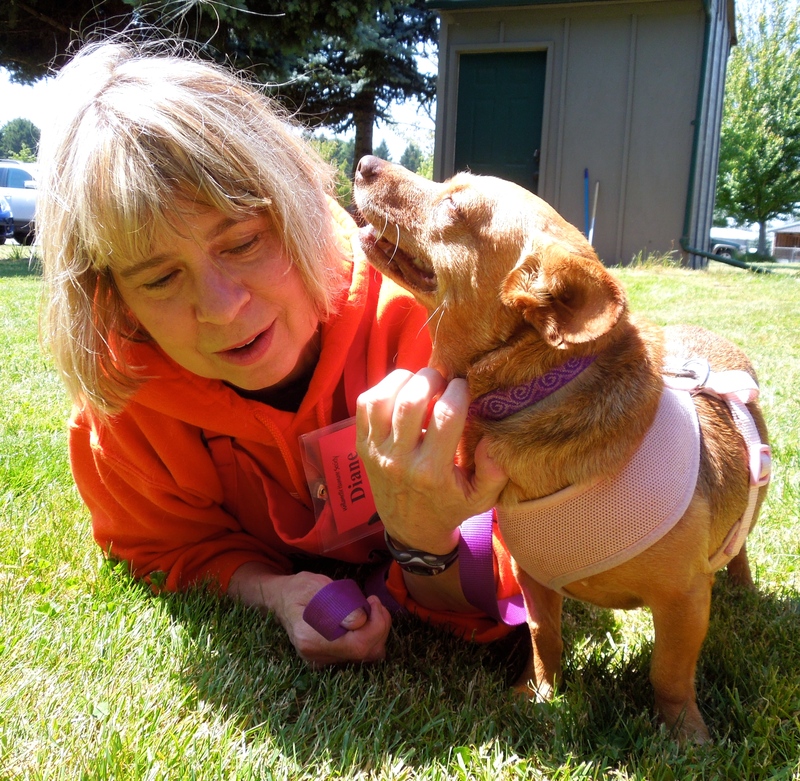 Penny has gained confidence and overcome her fear. She walks with a spring in her step and a smile. She eagerly took my hot dog bits and loved my petting. Diane couldn’t believe the change in this sweetheart, and spent extra time with her just for fun. Here are some pictures of their time together. What a cutie! Sure hope she gets her new family soon! I’m hoping and hoping my new family will come soon. I want to go home. Jasmine is a three-year-old Shepherd mix who has spent quite a long time at WHS. She was adopted once, but had to be returned because of her strong desire to chase cats. She will need a feline-free home. 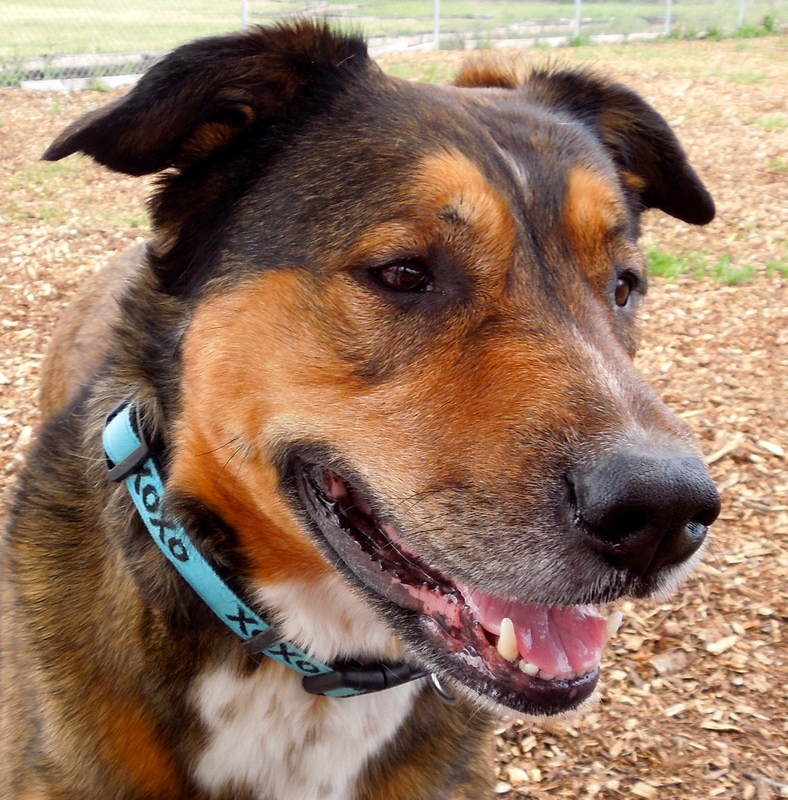 Jasmine is a quiet, gentle girl who enjoys long walks and does well on leash. She would do best with older kids. She seems sad in her kennel, but once outside she brightens up. She is looking for someone who will give her the love and attention she has been missing. As you can see, Jazzy has become one of Alexis’ favorites. Here Jasmine was today with Joan. She loves to just hang out with a person. See this smile? It’s meant for YOU! 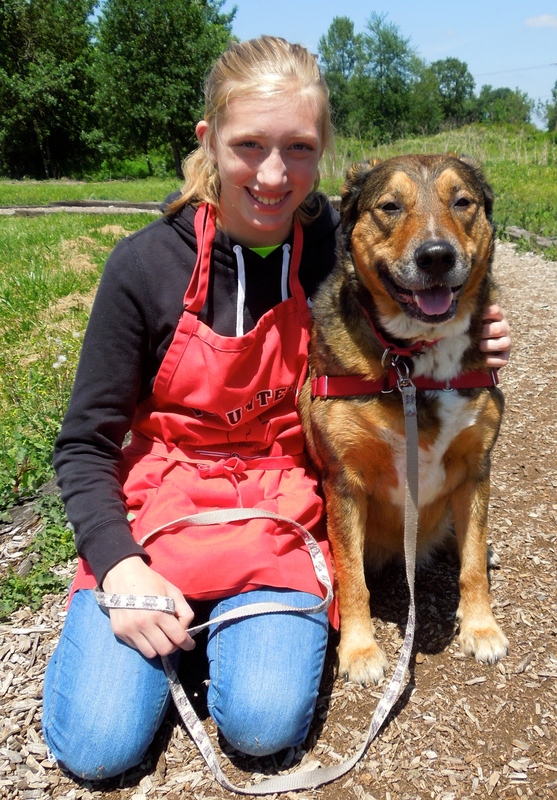 I have grown very fond of Nicki, a six-year-old Australian Cattle Dog mix. She is always so cooperative for my pictures, takes treats politely, and walks nicely on leash. 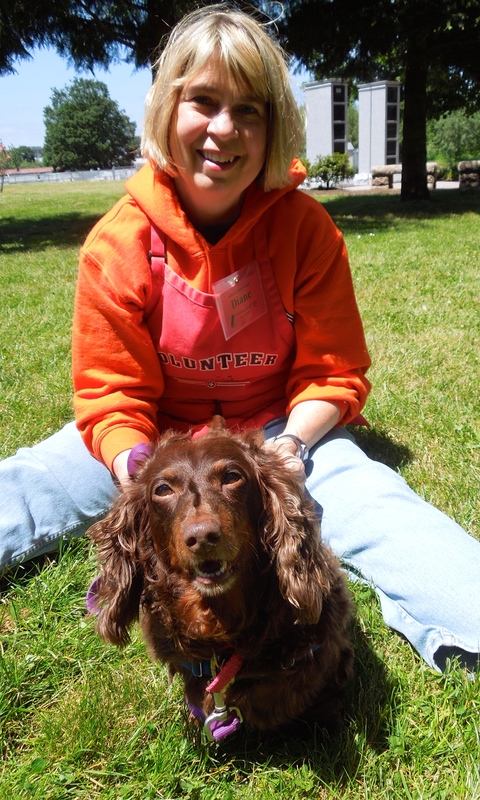 Volunteer Bryan enjoyed his time with her on Sunday. Nicki prefers people to other dogs. 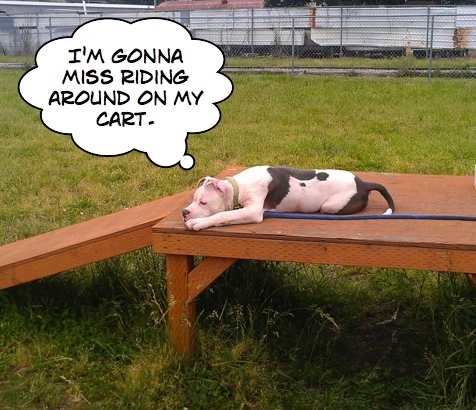 She has been taken out to play group lately, and she will walk around, but doesn’t want to mingle with the other dogs. She would rather spend her time with her human friends. 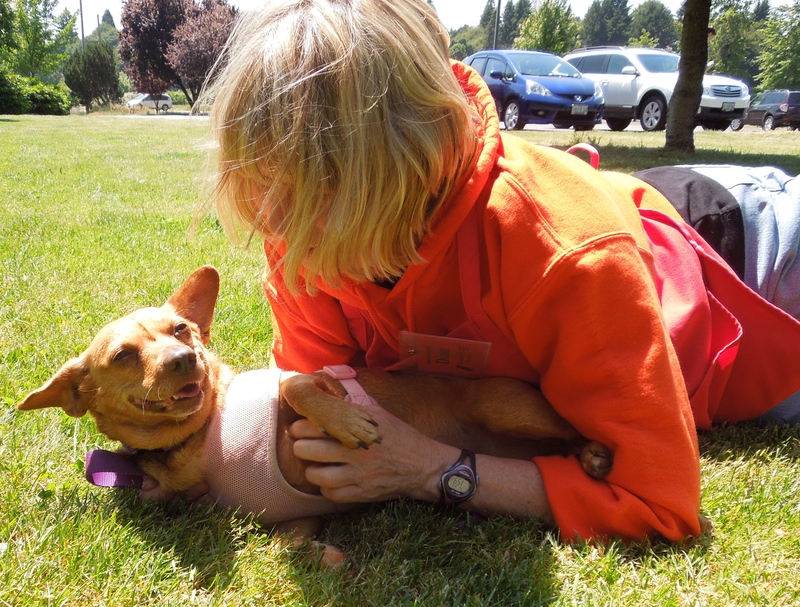 There must be the perfect home for her, with someone who wants a loyal companion and good friend. I know I need to lose a few pounds, but I can still be a lap dog! Ah, my sweet Sheila! Yes, a tad chunky, but with a heart of gold. This sweetheart came to us through S.T.A.R.T. after spending five months in a California shelter. 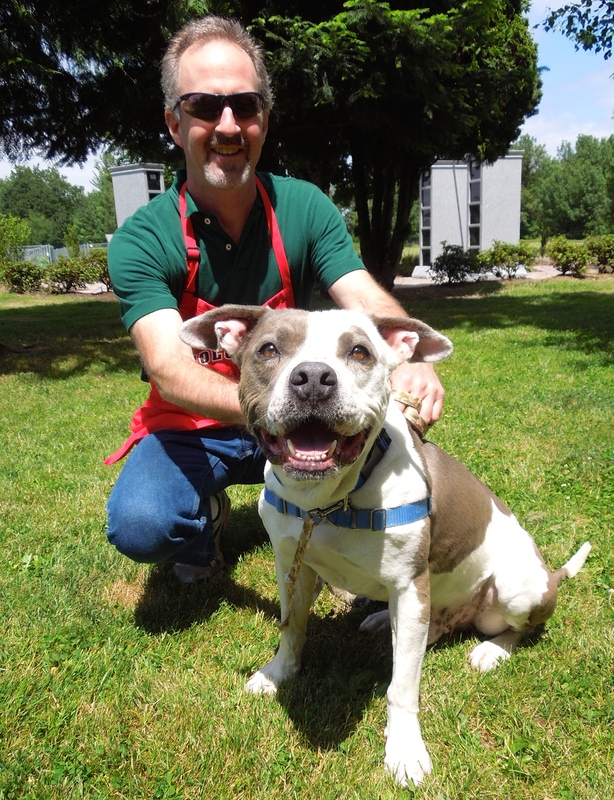 Sheila is a five-year-old Pit Bull Terrier mix who wants a family of her own to love. I’m really surprised she hasn’t been adopted yet, I mean look at that face! (Hers, not mine!) Maybe this week will be her lucky one! One reason I love her is because she gets my jokes! I’m new! I’m young! I’m available! 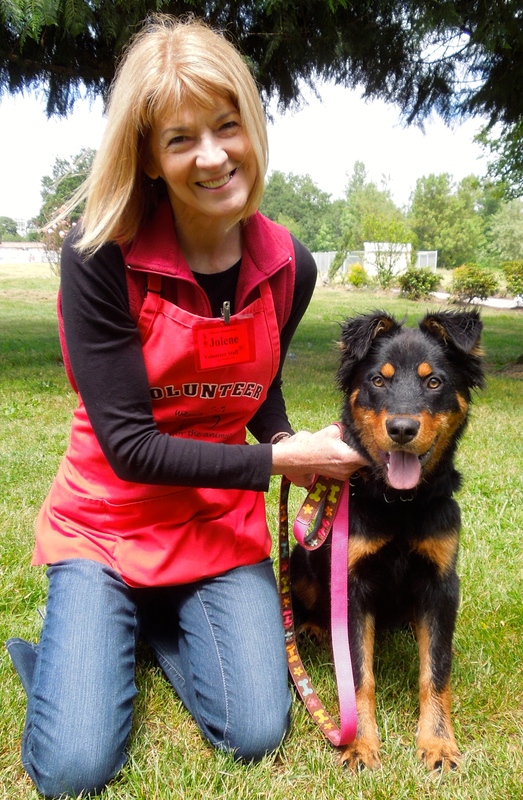 Meet Scrappy, a ten-month-old Australian Shepherd mix, another California S.T.A.R.T. dog. Is that one of the cutest faces ever? We don’t know much of Scrappy’s history, but he has gotten along with the shelter dogs, is eager to learn, and loves people. He would have a great time and learn lots in a WHS training class. Jolene had fun getting to know him on Sunday. I’ve come a long way since I first came here! 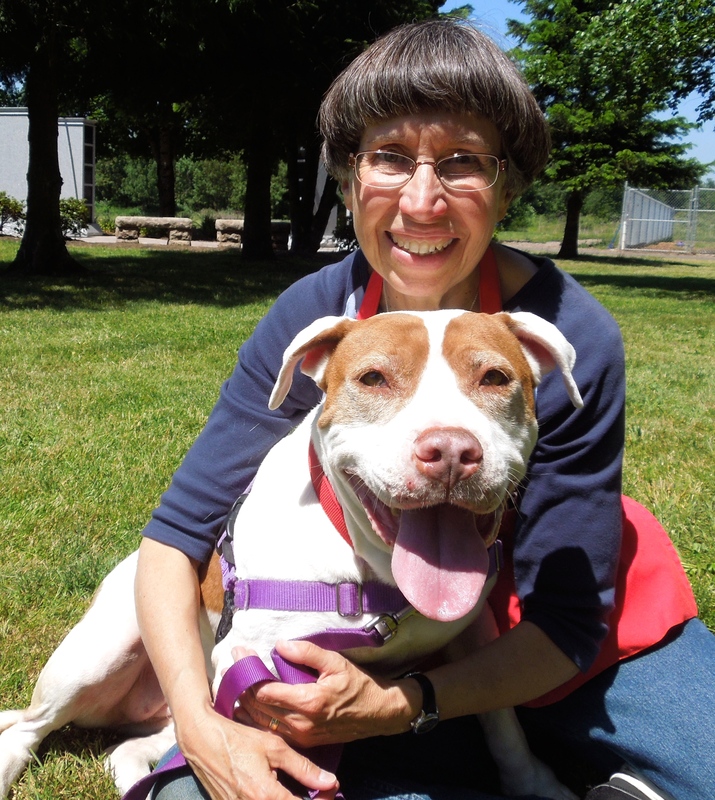 Lady is another S.T.A.R.T.-rescued dog who is hoping that Oregon will be her forever home. She arrived in February, was adopted, but returned when the family moved and couldn’t take her with them. She spent some time in a foster home and did great. 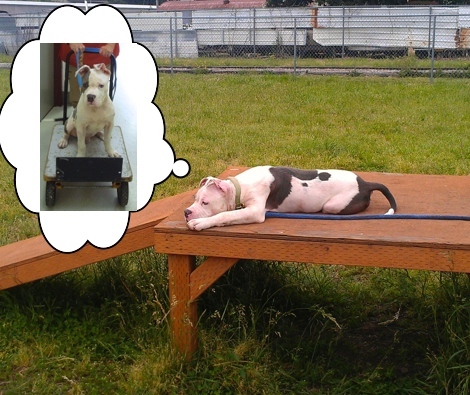 She LOVES play group and does very well with other dogs, loving to romp and play hard. She can also be very gentle with people and is respectful, smart and loving. 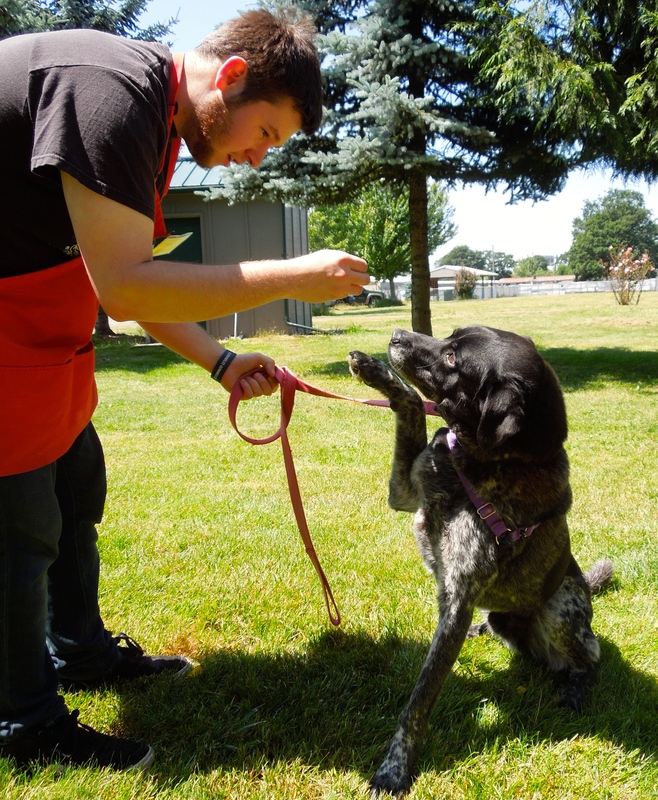 She walks well on leash, takes treats politely and is eager to learn new things. This girl is a gem! We’re hoping her new family will take her home soon! Here she was with Francis on Sunday. I’ve been waiting for this little girl to become adoptable. She’s had some medical issues that the shelter has been working on and now she’s available to go to a loving home! 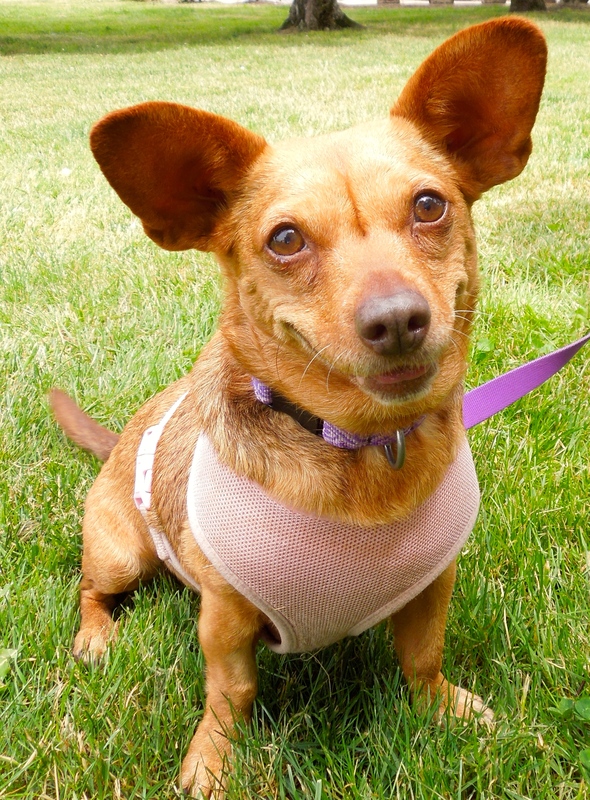 Her name is Audora and she is an eight-year-old Dachshund mix. She is loving, smart, and eager. She does need to lose a little weight, but walks in the neighborhood and fewer treats should be just the ticket. Diane had a great time with her on Sunday. Each week since Roxy arrived at the shelter in April, Emelynn has taken her out first and again after all the dogs have been walked. 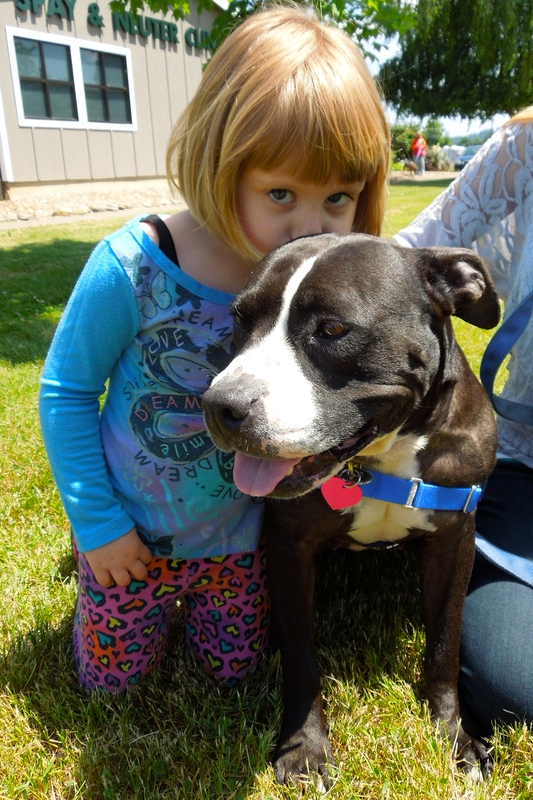 Roxy is a shy three-year-old Boxer/Pit Bull Terrier mix. 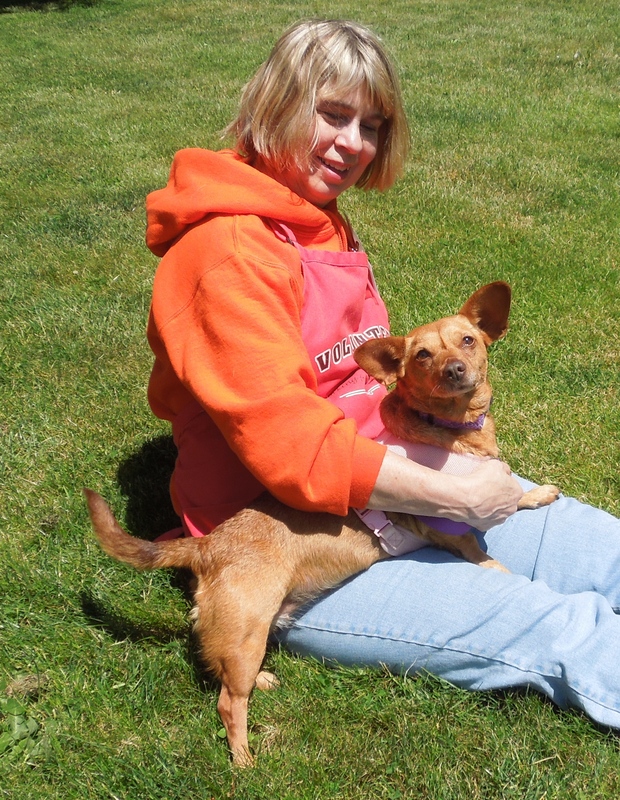 Her timid behavior may be the reason potential adopters walk past her kennel. 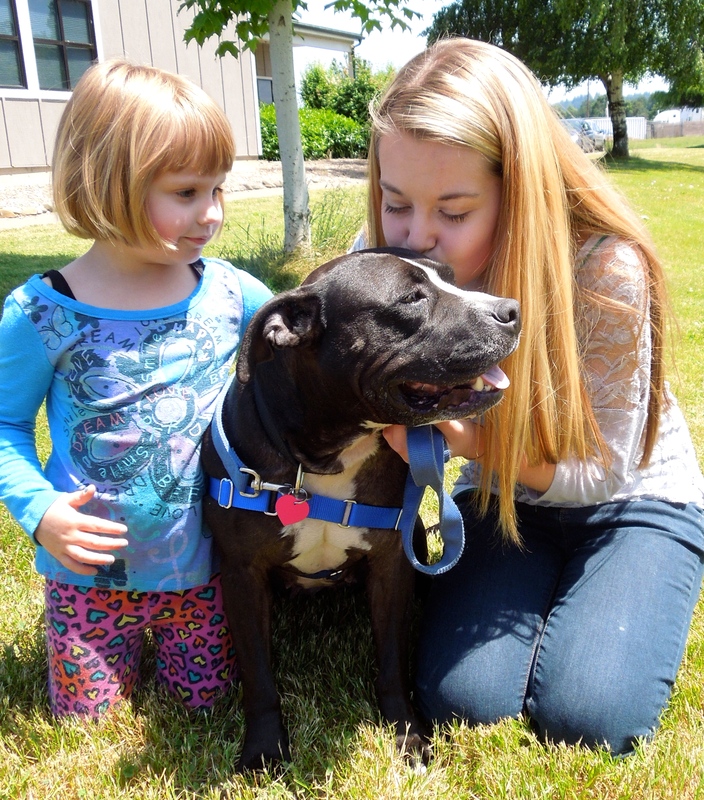 She is a sweet, calm, gentle soul who so much wants a family of her own. 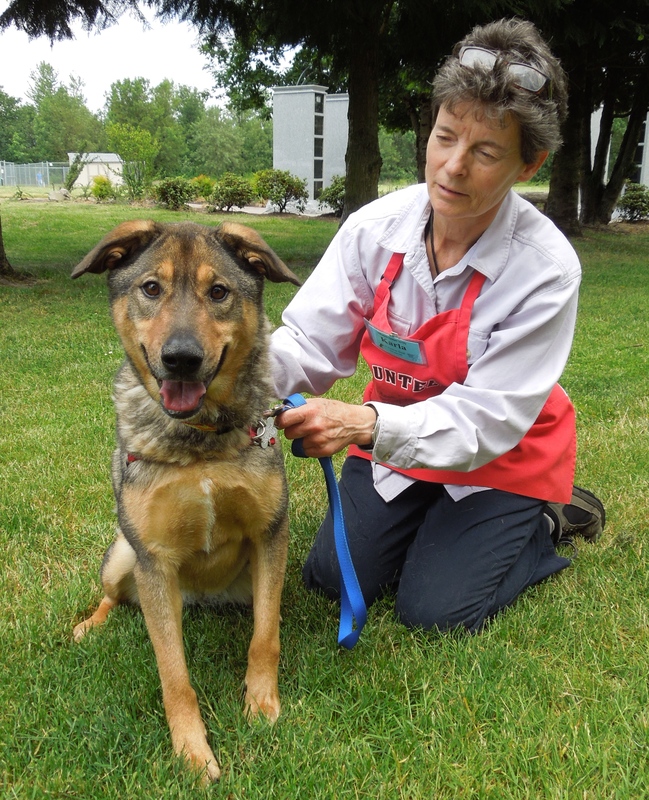 With a little understanding and patience, this girl will make a wonderful forever companion. We hope she will be adopted soon. There were two new arrivals whom I met today. I don’t know them well yet, but wanted to introduce them to my readers. 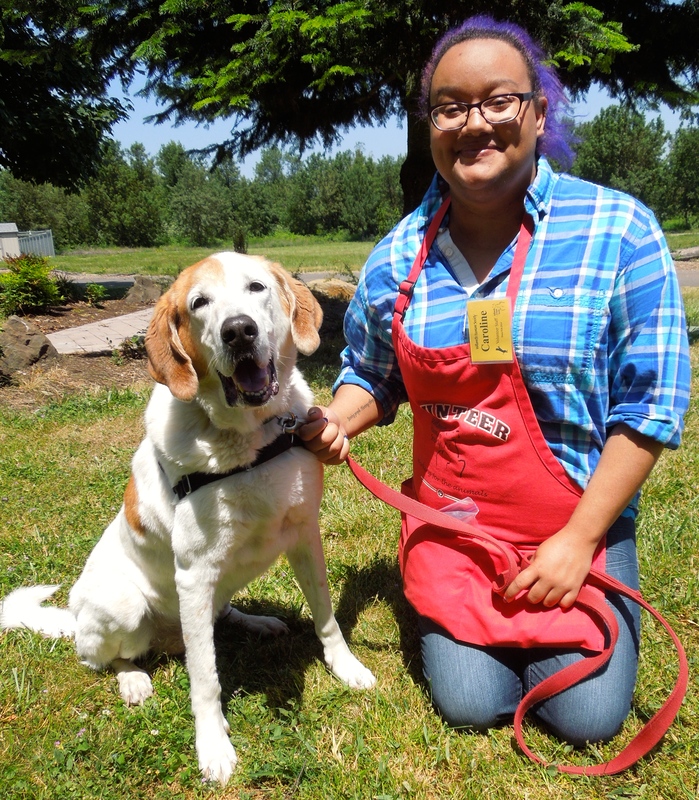 First is Sawyer, a seven-year-old Hound mix. 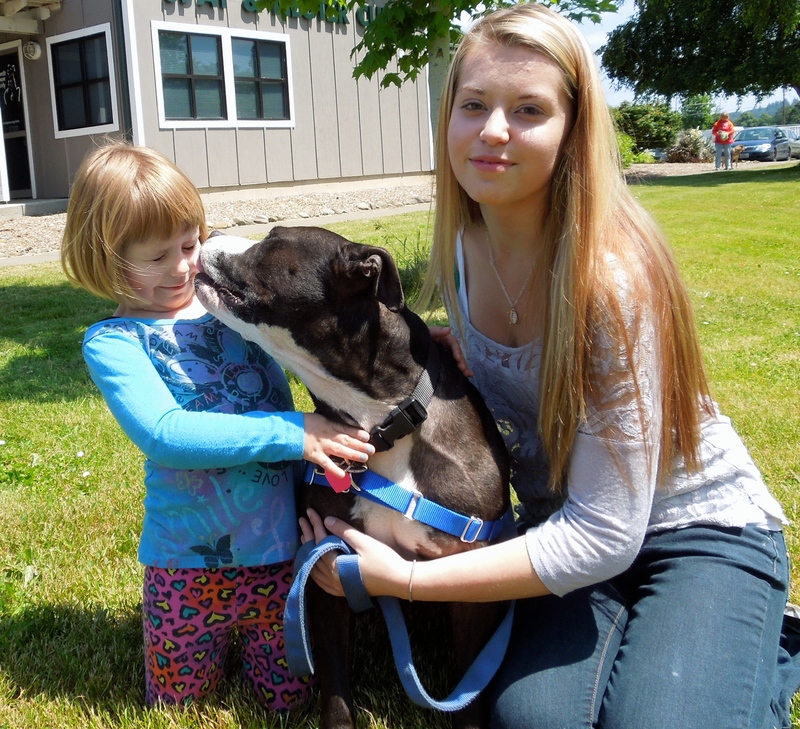 He has a good history with other dogs and children and Caroline certainly liked him! He loved my hot dog bits and smiled when asked. He’s a good boy! 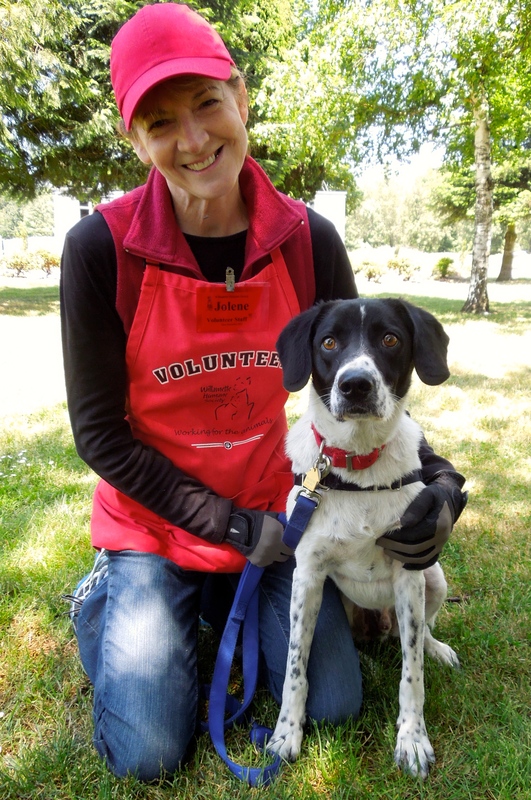 The second new dog is Max, a five-year-old Pointer/Border Collie mix. He is active but polite, and seems to get along with other dogs. He loved my hot dog bits. I bet he will be a great family dog. Here he is with Jolene today. I love his masked face! 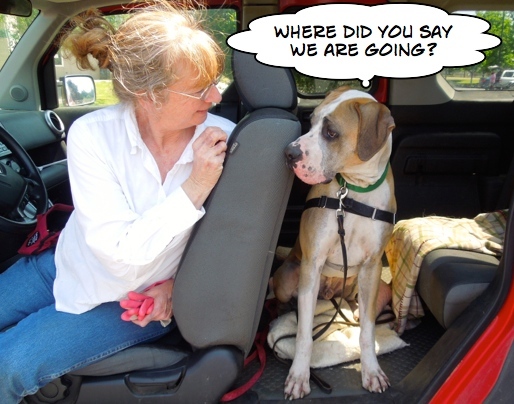 I was leaving the shelter on Sunday just when Linda and Chevy were leaving also. They were going on a practice run to My Dog’s Gym. Now, Chevy might not look excited to the casual eye, but those of us who know him, can see he was VERY excited (well, I may be slightly exaggerating). 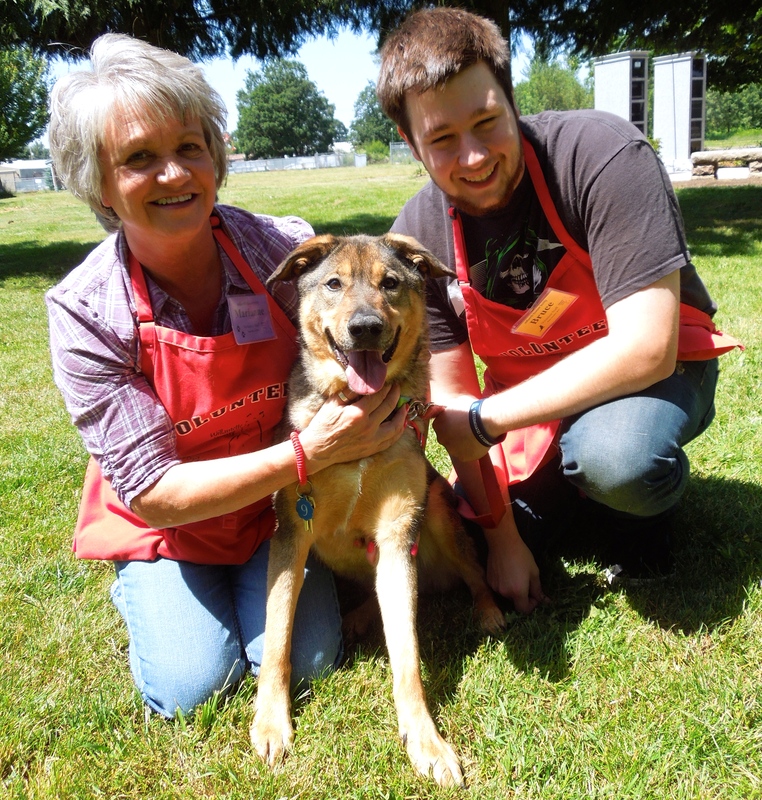 Chevy has won a scholarship for some training classes through Fences for Fido! Of course, I had to get some pictures as they left. And by the way, Linda said he did great in the car. His classes start next Sunday. Stay tuned! As promised, here’s an update from Jasmine! 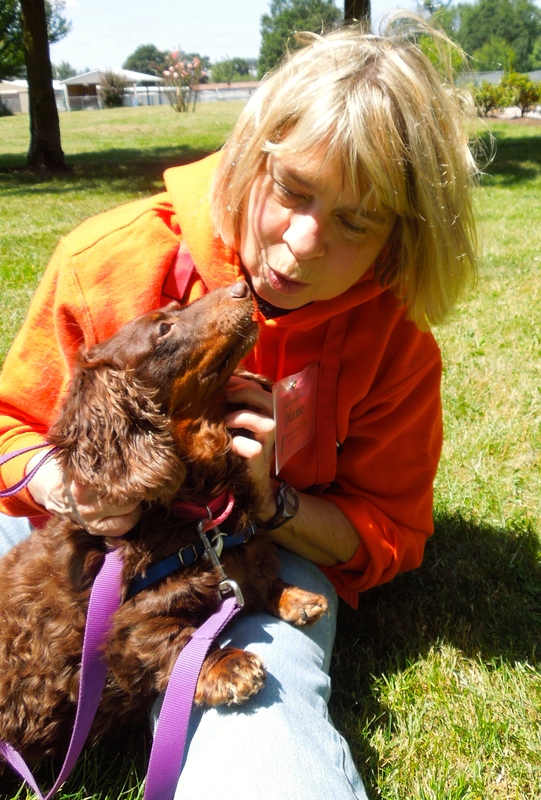 Love what you “heard” from puppy Sam’s chatter!!! My, my! Adrian won the lucky lottery! Reading your blog from Tennessee this week instead of South Carolina! 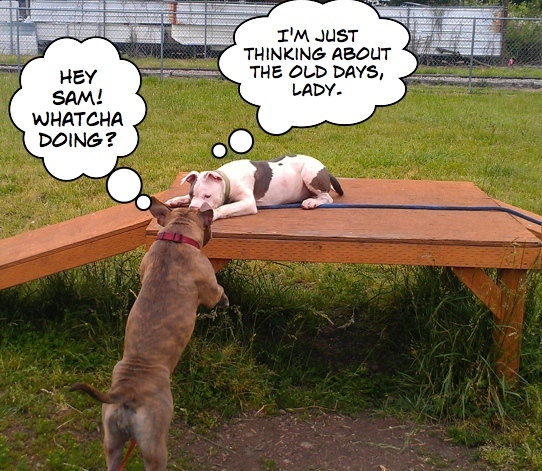 So glad to see Sam get out to socialize with the other dogs and get some needed run around time. Too big for puppy visit room.